Work Zone Safety is in Your Hands. 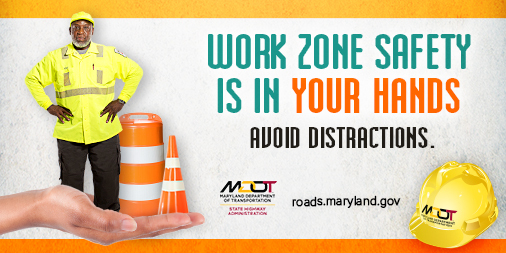 The Maryland Department of Transportation State Highway Administration’s (MDOT SHA) reminds drivers that work zone safety is everyone’s business. The campaign issues a plea to stay alert and use caution when driving through or near work zones. With a historic construction season underway, our workers out every day across Maryland on hundreds of projects: mowing, repairing pot holes and building/repairing roads and bridges – making our State safer for you and your family. We understand highway work zones can result in delays and frustrations. Spring and summer are heavy roadway construction seasons, and there are tools available to help you plan ahead. For a complete listing of major roadway projects in Maryland, click on Road Ready, an online construction brochure. In work zones, there is little to no margin for driving error. Driving too fast, inattentively or aggressively through a highway work zone places the lives of highway workers at risk. At the same time, you’re also risking your life and the lives of your loved ones. 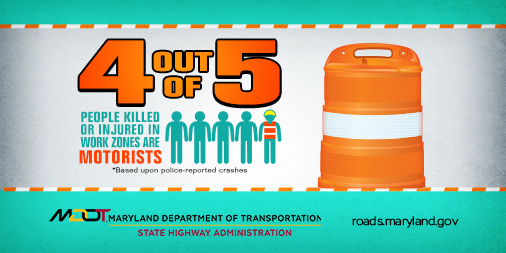 Four out of five people who die in highway work zones are either drivers or their passengers. Safer driving. Safer work zones. For everyone. Maryland Supports National Work Zone Awareness Week! Meet Bernie, the Barrel Man! Bernie has an important message: Slow down and stay alert in work zones! 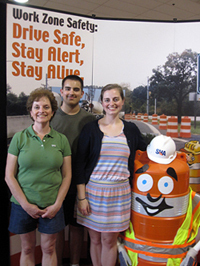 Bernie was created by Carl Moser (left, middle) to help spread the message about the critical need to slow down and stay alert in work zones. Carl’s father, Rick Moser, was killed by a speeding, inattentive driver while performing maintenance on a Frederick County bridge. Rick was a Team Leader at MDOT SHA's Frederick Shop. The Moser family is on a crusade to spread the message about the staying alert in work zones to prevent another family from experiencing their tragic loss. If you are concerned about something you’ve seen in an MDOT SHA work zone, please report it through our Customer Care Management System. Maryland photo enforces speeds in eligible work zones for YOUR safety and the safety of our workers. The Maryland SafeZones program allows the Maryland State Police and Maryland Transportation Authority Police to enforce the speed limit in highway work zones with automated camera equipment. 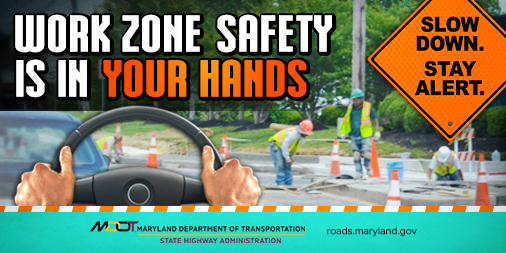 The Maryland SafeZones program was created to improve safety for workers and travelers since nationally, four out of every five people injured in highway work zone crashes are drivers or passengers. Speeding violations in SafeZones construction sites have decreased by more than 80 percent. When the program began, approximately seven out of every 100 drivers in the SafeZones construction areas were exceeding the speed limit by 12 mph or more. Today, fewer than two drivers out of every 100 are receiving citations in SafeZones. See chart below demonstrating dramatic decrease in speeding violations since the start of the program. Please click here to visit the Maryland SafeZones website.